Gentian Relieve Allergies naturally cools skin and is recommended for use in dogs and cats with seasonal allergies. An allergy is a hypersensitive reaction to food, inhalant, or contact. The body’s defenses are signaled into an overreaction to a particular substance. This hypersensitivity often causes extreme heat in the animal, seen as reddened skin, hot weepy lesions, panting, restlessness, and skin that may be hot to the touch. The herbs in Gentian Relieve Allergies cool heat and harmonize the body’s defenses to help support normal skin functions. By maintaining healthy skin and normal histamine levels and supporting the normal detoxification processes, Gentian Relieve Allergies soothes skin-related issues associated with seasonal allergies. Pair Gentian Relieve Allergies with Milk Thistle for extra support during allergy season. According to Chinese medical theory, the liver acts as a pump that provides the smooth flow of energy, or Qi (pronounced “chee”), within the body. When allergies lead to Liver Qi Stagnation, an imbalance within the liver, the “pump” overheats and produces skin that may be hot to the touch. The herbs in Herbsmith Gentian Relieve Allergies harmonize the liver and clear this heat without hindering the dog’s overall vitality. Chinese medicine explains that life is a balance of yin and yang. Yin represents the fluids, maternal, quiet, nighttime and passive aspects of the body. Yang represents the heat, inflammation, active, male, daytime and aggressive aspects. When allergies exist the body is in a state of excess heat, or yang. As the heat increases, it eventually burns off the essential fluids, or yin. This depletion of fluids causes the development of phlegm in a pet. Phlegm is seen in the form of a greasy coat, foul-smelling breath, and eye and ear discharge. Herbsmith Gentian Relieve Allergies resolves the heat and excess yang. With proper diet and care, the yin is replenished and healthy skin is maintained. 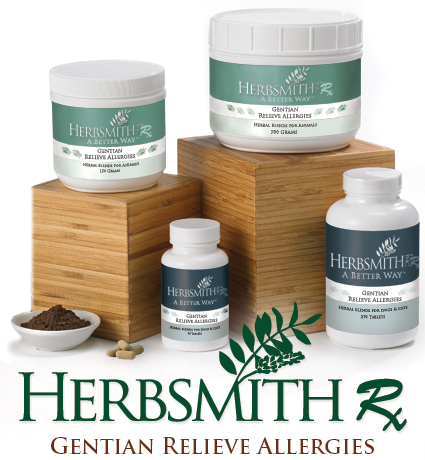 Herbsmith Rx Gentian Relieve Allergies is available in Powder, Tablet, and Herbal Bite form. Listed below are the suggested serving sizes based on form and species.